With summer in full swing, it feels like it's hot all the time now. And because of that it's hard to get my coffee fix, because who wants hot coffee on a hot day? Being from Washington State, I figured that sometime or another I would have to do a project related to coffee! 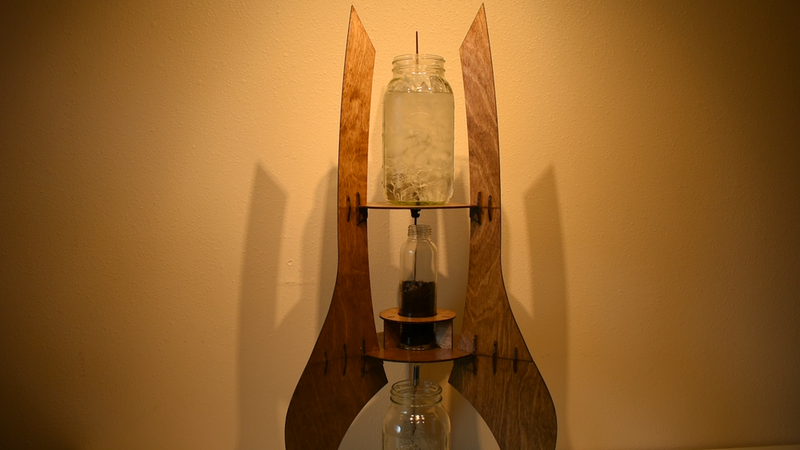 So what better coffee related project could I do right now than make a cold drip coffee tower? And why in the shape of a spaceship? I wanted to use my laser cutter to make a tower that was both functional and "aesthetically pleasing". And I was quite happy with the results! 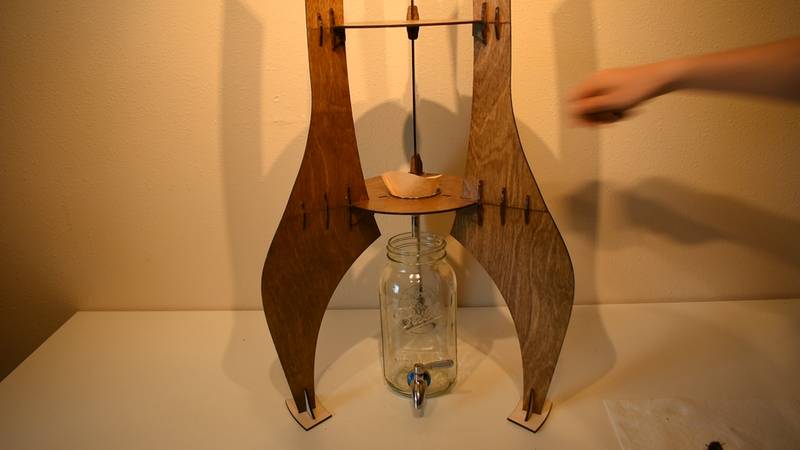 In the following post I share the process I went through for making my own cold drip coffee tower (including the laser cutting files necessary to cut the pieces). The basic structure of the tower is made from laser cut birch plywood. Starting from the top, the parts that are involved in making the coffee include the glass jar that holds the ice water, which has a drip emitter on the bottom to control flow into a glass bottle below that holds the coffee grounds, which drips water into a funnel below it directing it to another glass jar at the bottom that holds the finished coffee. Tools and materials are listed below. With the exception of the birch plywood, I purchased all of my parts on Amazon. I did my best to make the design multipurpose so that you don't need to purchase the exact same parts that I got. However, if you use a different funnel or glass bottle, you might need to modify the hole that the funnel sits in and the hole that holds the glass bottle up. How the piece that was cut perpendicular to the grain of the wood bends. Don’t make the same mistake as me! 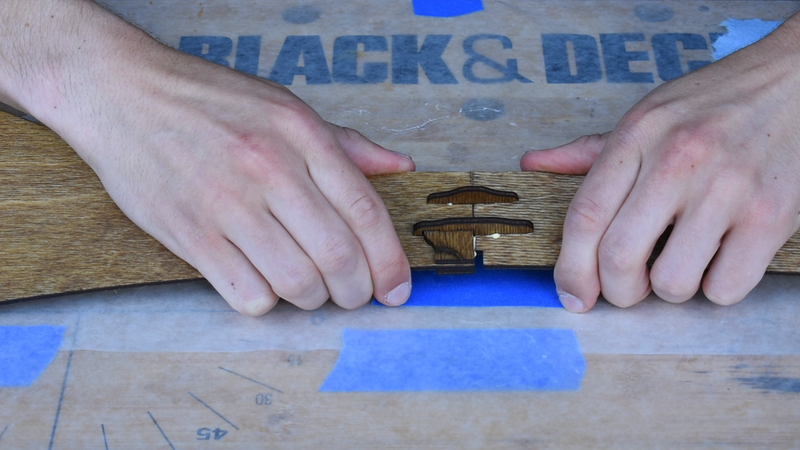 When cut in line with the grain of the plywood, it is much more rigid. This is what you want. I've already created the template needed to laser cut the parts, so the first step is to download and laser cut the pieces for the coffee tower. Files are included below. I finalized this in Inkscape, so the native file type is SVG, but I also exported it into DXF. The design uses about 1 and a half 18 x 24 in sheets of 1/8 in plywood. I tried to make sure that the largest pieces were about a foot long, so even smaller laser cutters can cut all of the pieces. Plywood is made of gluing sheets of wood perpendicular to each other. But because 1/8 in plywood is so thin, mine and likely yours are only 3 sheets thick. Because it is an odd number, This means that one direction is going to be much more rigid than the other, and because this design is close to the limits of what 1/8 in plywood can support, you want to make sure that the rigid side is in line with the height of the tower. I forgot about this when I first cut the pieces, and cut some of them perpendicular to the rigid direction, and as you can see, it makes a big difference in the bending of the piece. The next step in the processes is sanding, then staining. This part is optional, however I definitely think it improves the look, and it's a good idea to add a water resistant coating to the tower, because the glass jar on the top that holds the ice water is going to cause condensation, and expose wood near it to moisture. 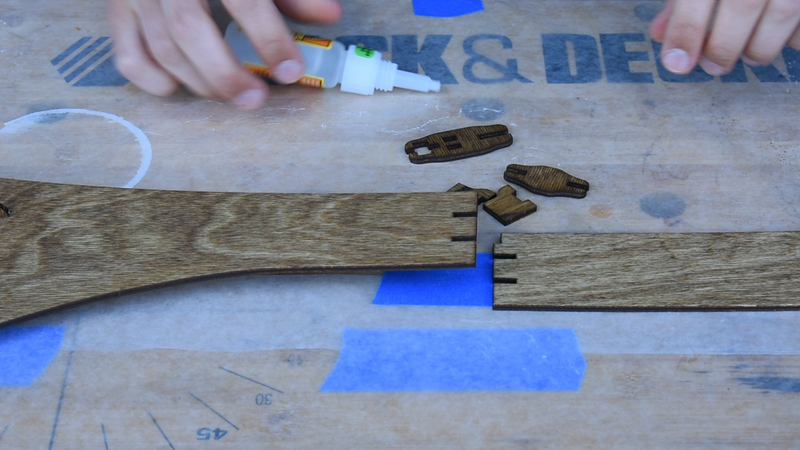 When applying stain and surface finishes to laser cut pieces that I will be gluing together, I like to stain the wood, then glue the pieces together, and finally apply the finish to the wood. I stain before gluing, because leftover glue can prevent the wood from absorbing stain. And I apply the finish after gluing together the pieces because any finish that dries in the joints that connect the pieces can make it harder to insert the pieces correctly. 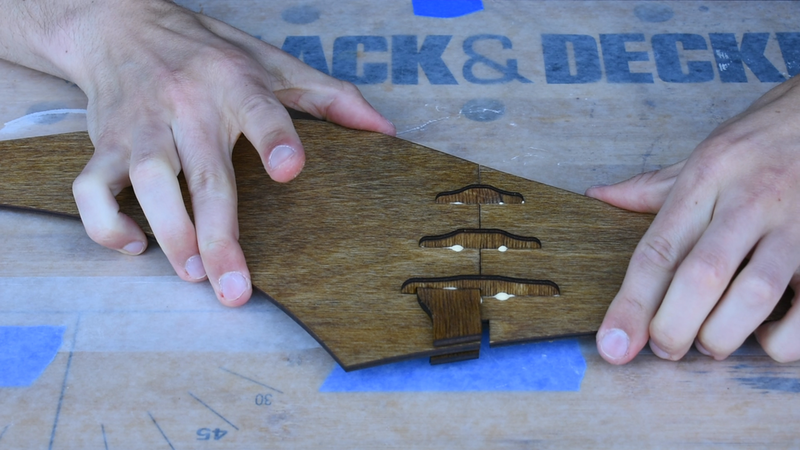 Now for the gluing, the bottom two segments have 3 joints where 3 connectors are inserted to help keep the segments together. 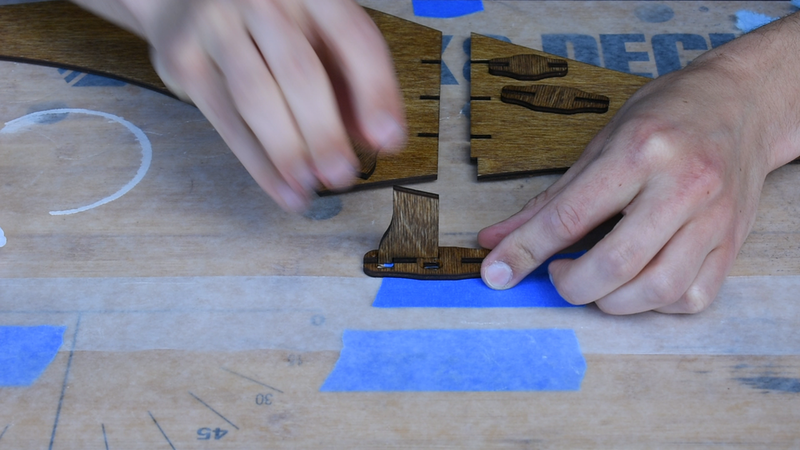 Furthermore, the piece that goes in the front joint has it's own slots for two more pieces that will be glued to the sides to help increase the surface area that the platforms have to sit on. For this process, I used quick drying super glue, and wood glue. To start, the two pieces that go on the side were superglued to the front most connector, and then I applied wood glue to the inside portions of the two side pieces. Next, I added wood glue to each of the joints on one side of the connectors and then fit the 3 connectors into the joints. Then I repeated this on the other half of the joints, and slid the two segments together. I found that using a toothpick was an easy method to insert the glue without being too messy. But it does still involve some wiping off of glue. Then you go through the same basic process for joining the top two segments, but this one has only two joints. Also take note that joining the top two segments uses a smaller front connector and side pieces. With that done I noticed that the side pieces didn't quite sit flat with the segments, so I added a little super glue to the end of the pieces, and then clamped them together for a short amount of time to make that they were flat to the surface. This entire process needs to be done three times for all of the support pieces. The only other assembly that needs to be glued together is the circular piece that holds up the glass bottle that contains the coffee grounds. If you are confused in any of these steps, the video I shared at the start does a good job showing how to go through the gluing process. The last working that needs to be done to the wood structure is applying the wood finish. I used a polycrilic finish, and also applied 3 coats. The other parts that need to be modified are the glass containers. I didn't find any glass containers that had holes cut in the correct areas and were reasonably economic, so I opted to make my own. This was both cheaper, and made sure that I could suit the containers more exactly to my needs. I did my best to make the design as interchangeable as possible, so that you don't have to use the exact same parts as me. The easiest method I found to cut specific sized holes into glass is using diamond coated drill bits. You can get sets of them on Amazon or Ebay for probably around $12. 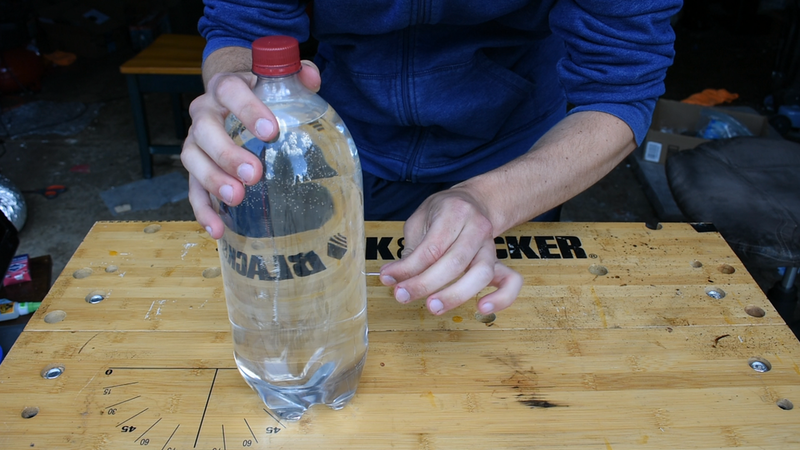 When you are cutting into the glass, using lubrication will help extend the life of the drill bit, and a nice trick that I found to help automatically provide this is to poke a small hole into a soda bottle and then unscrew the cap. I used two sized drill bits when cutting. The smallest I used for the hole that the drip emitter will go through and the hole that goes on the bottom of the bottle that holds the coffee grounds. The larger I used for the optional spigot that you can put on the bottom glass jar. 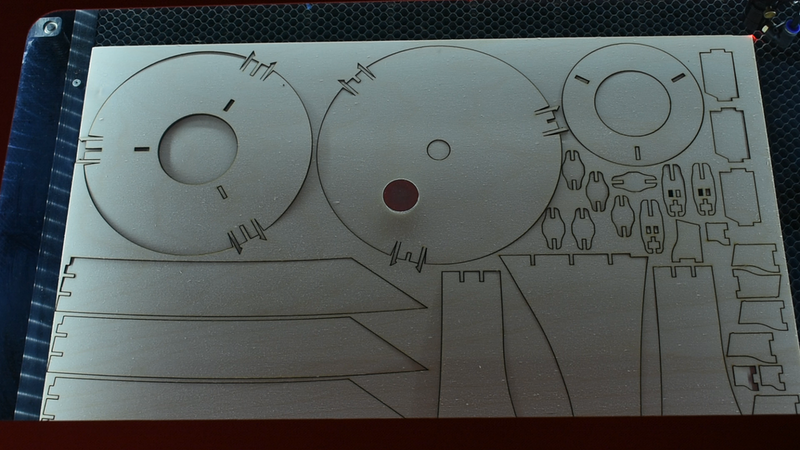 I then laser cut two holes that were the size of the two drill bits, which will help guide the drill bits when starting the holes. To do the cutting I marked the rough center in sharpie, then taped the holes over the center mark, started the water, and cut through the glass. The basic process for cutting is to put very little weight onto the drill, and rotate the drill slightly during the cutting. 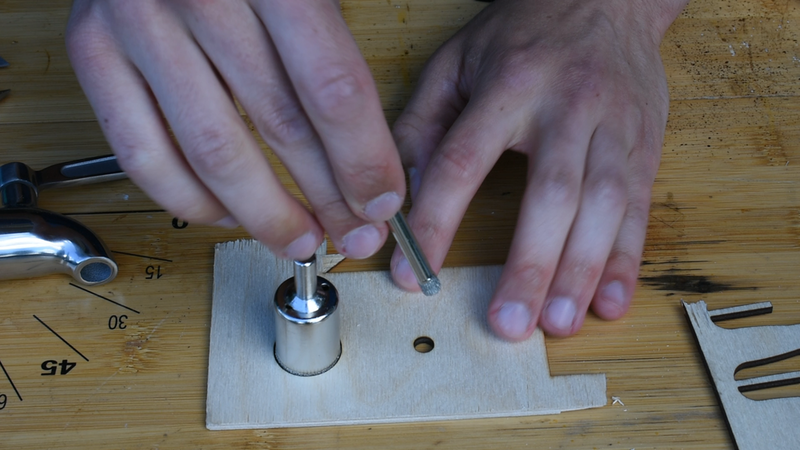 I then cut the same hole for the glass bottle, and the larger side hole for the bottom jar. The joints on each of the platforms are made so that they pop on to the side. It ended up a bit cruder than I would have liked, but this helps makes sure that the platforms won't slide off from the vertical pieces without making the joint permanent. That way the tower can be disassembled if you ever want to store or move it. The basic process for assembling the tower is to snap on both of the platforms on one of the tower segments, and then carefully snap on the other two segments. After I assembled the tower, I wasn't quite happy with how much it wobbled. My main concern was that the bottom of the columns would slide out from under the tower and cause the segments to buckle. So I laser cut some feet to add to the vertical supports to make sure that the vertical segments wouldn't slide as easily. And after adding the feet, I was much happier with the results. 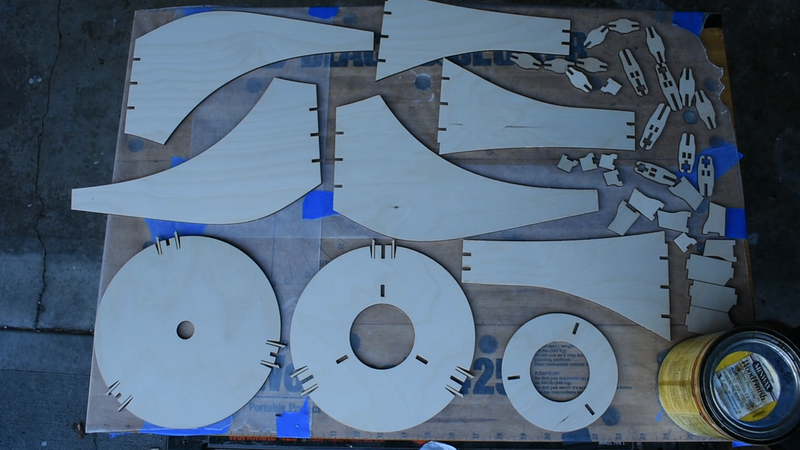 These pieces are included in the laser cutting file. I won't speak much about cold drip coffee recipes because I'm still pretty new to this myself. But a general recipe I found used a water to coffee ratio of about 11:1. 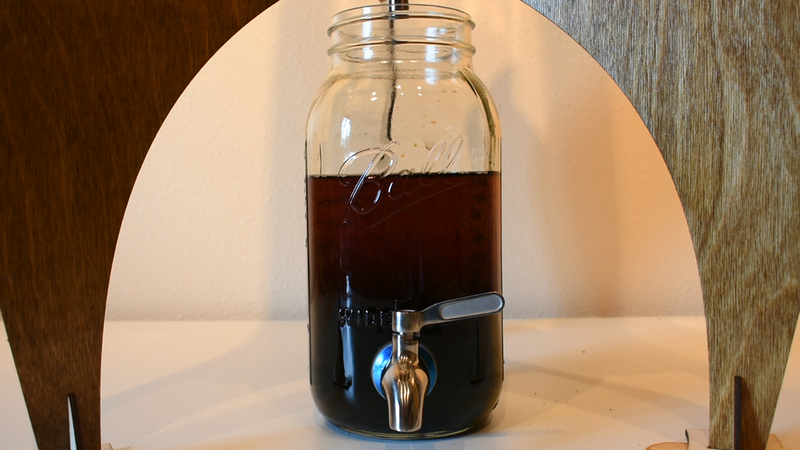 After filling up the glass bottle with about 6 ounces of coffee grounds, I put the bottom glass jar in place, then added the funnel and cut up a coffee filter to place under the hole in the glass bottle, so that coffee grounds wouldn't drip into the bottom jar. I then added the glass bottle, and poured some water into the coffee grounds to moisten it. To add the top jar, I filled it part way up with water, and used my finger to plug the drip emitter on the bottom while I carried it to the tower (not that it will leak much). And once on, I filled it up the rest of the way with ice. And that's the basic process. Now we wait! I found that this drip tower takes a while, because the drip emitter slows down gradually as the water level decreases. From my first couple runs, it took a little longer than 12 hours to completely drain all of the water. I used the slowest drip emitter I could find for this, which was rated at a 1/2 gallon per hour. If you want to speed up the process, you could get a faster dripper. So how does the coffee taste (coming from a complete amateur)? It is definitely different than regular coffee; the best way I found it described was that cold drip coffee brings out more subtle flavors than hot brewed coffee. And overall I am quite happy with the result. Now I can drink coffee on a hot day!